India's rapid groundwater depletion, coupled with climate change and a rapidly increasing population has certainly put India on the forefront of an environmental disaster. With half of its labor force in agriculture, and a large dependence on groundwater due to the monsoonal climate it is imperative that good policy is put in place to manage groundwater, attenuate malnutrition, and secure livelihoods. A lack of appropriate hydrogeological tools to monitor groundwater in these fractured hard rock unconfined aquifers has made it particularly challenging to understand the causal mechanisms that current agricultural and energy policies are having on consumptive behavior in the region. To address this knowledge gap, there are two main objectives of this research: 1) estimate annual groundwater renewal in fractured hard rock terrain using established methods; and 2) develop a hydrogeological tool that can measure groundwater recharge at the well-to-well scale in a simple, cost-effective way. This project site is located in the rural state of Rajasthan, one of the driest and water scarce regions of India. This research was conducted within Jaisamand Lake basin, which is currently a pilot site for the Global Network for Water and Development Information for Arid Lands (G-WADI) – a UNESCO program that promotes international and regional cooperation to strengthen water management in arid regions. Bounded between longitudes 73º 45’ E to 74º 25’ E and latitudes 24º 10’ N to 24º 35’ N, the Jaisamand Lake basin is composed of non-perennial rivers which flow during the rainy season. The Gomti River is an important tributary to Jaisamand Lake – Udaipur city’s major drinking water supply. The Gomti River originates in the Gangeshwar watershed and is part of the larger Mahi River basin. The Gangeshwar is a rural watershed mainly inhabited by tribal villages that rely on agriculture for subsistence and income generation. Land-use is dominated by agriculture, and native perennial vegetation is mainly characterized as forested and open scrubby land. Agricultural crops (primarily: maize, rice, wheat, mustard, cotton, pulses, groundnuts, opium) are harvested after the summer monsoon in winter (kharif), in spring (rabi), and more rarely, during the summer (garmi). Groundwater is mainly accessed from open-dug wells (2 to 30 meters depth) and hand-pump tubewells (60 to 100 meters depth). Groundwater is exclusively relied on for domestic needs year-round, and for irrigation outside the monsoon season. Rainfall is monsoon driven and highly seasonal, with ~95% of the annual rain falling over 25-45 days between June and September. The arrival date of the monsoon varies annually, but the monsoon season generally spans from mid-June to mid-September. The monsoon rains directly support rain-fed agriculture during the monsoon period, with minimal irrigation occurring. Groundwater recharge by the monsoon rain serves as a crucial resource for the irrigated agriculture that occurs in the post-monsoon dry period. The growing season in this region ranges between 90 and 120 days annually. Agriculture and domestic water are the main uses of groundwater. Concerns over future climate change beg the question over how the earth's climate has changed in the past. Climate records created from ice cores are often constrained by the drilling depth, since older ice is at the bottom. Deformation of ice in the Allan Hills, due to natural geophysical movements of the glacier, has brought old ice to the surface. This makes it easier for glaciologist to drill older ice that is closer to the surface. After a 2.5-2.8 million year old meteorite was found in the Allan Hills, scientists at University of Maine and Princeton University decided to see if the ice around it was as old. 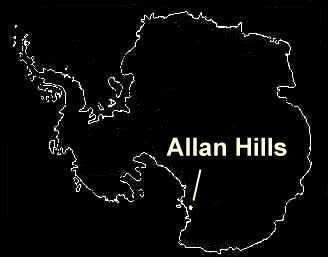 The Allan hills is located near the Dry Valley in Antarctica, south of New Zealand.